THE new Robert Burns Birthplace Museum that will be located in Alloway in South Ayrshire is one step closer, thanks to £5.8 million of Heritage Lottery Funding (HLF). The funding has been secured by the National Trust for Scotland, which now needs to raise an additional £5 million itself towards the project. This will be added to the £5.8 million of HLF funding, a £5.5 million contribution from the Scottish Government, £500,000 anticipated from Scottish Enterprise Ayrshire, and land in Alloway worth £2.8 million from South Ayrshire Council. South Ayrshire Council Provost Winifred Sloan met representatives from the organisations involved in this visionary project at Burns Cottage to celebrate the good news. The creation of a new museum will enable the entire Robert Burns collection of manuscripts, correspondence and artefacts to be housed in one building. Using modern methods such as interactive displays, the museum should encourage people of all ages to visit. 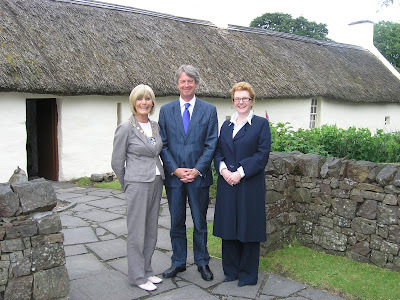 * Creating a world-class Robert Burns Birthplace Museum in Alloway. * Carrying out a major re-interpretation of the cottage where Burns was born. * Delivering exciting new education facilities. * Enhancing the Burns Monument, Brig o’Doon and Auld Kirk. Trustees of the Burns Monument Trust, who own most of the Burns landmarks and collections in Alloway, will hand over ownership to the National Trust for Scotland. Their Chairman, the Lord Lieutenant of Ayrshire and Arran, Mr John L Duncan, QPM, said: “Today’s announcement is great news for all with an interest in Robert Burns. Since 1814, the Burns Monument Trust has shouldered the responsibility of preserving the built heritage and collections of Burns and the announcement today will facilitate the passing of that responsibility to the National Trust for Scotland. The Alloway land where the landmarks and collections are located is owned by South Ayrshire Council. The Council, which has been very supportive of the charity’s plans in Alloway, will give the land to the National Trust for Scotland, worth an estimated £2.8m. Shonaig Macpherson, Chairman of the National Trust for Scotland said: “This is wonderful news for the Trust. We are extremely grateful to the Heritage Lottery Fund for granting such a substantial amount of money for what is unquestionably a prestigious and hugely significant Burns project. “The HLF decision shows great faith in the National Trust for Scotland’s ability to deliver such an important museum for the people of Scotland and Burns enthusiasts around the world. We must now play our part and raise several million pounds before construction of the museum and other Burns initiatives can begin. This will include a major public appeal to be launched in September. The National Trust for Scotland aim to achieve the re-interpretation of the cottage in 2009, the year of the Homecoming, and the 250th anniversary of the birth of Robert Burns. It is expected that the museum itself will be in operation in 2010. There are currently 277 Ayrshire business stories permanently archived on this site. To locate those of most interest to you, please use the site search facility in the top left hand corner of this page. Type your search term in the white box, then click “SEARCH BLOG”.